The new Roomba 880 features the revolutionary AeroForce™ Performance Cleaning System. Roomba 880 removes up to 50% more dirt, dust, hair and debris from all floor types. The tangle-free AeroForce™ Extractors are virtually maintenance-free, making it even easier for Roomba to tackle daily dirt build-up. Roomba 880 even cleans one room before moving on to the next for effortless, room-to-room cleaning. Tangle-Free AeroForce Extractors: Dual extractors grab and break down dirt and debris from any floor type with no hair tangles for you. Airflow Accelerator: Creates a sealed channel that concentrates airflow, drawing in more debris. 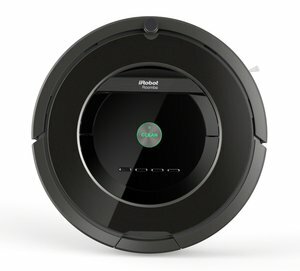 High-Efficiency Vacuum: Provides a 5X improvement in air power than previous Roomba generations. Vacuums From Room-To-Room: The Virtual Wall® Lighthouse™ contains Roomba in one room until it is completely vacuumed then directs Roomba to clean the next room. Can also block off-limit areas. Cleans On Schedule: Roomba can be preset up to seven times per week. Compatible With Select Existing Accessories: Roomba 880 is compatible with existing Roomba Virtual Wall barriers, Virtual Wall Lighthouses and Remote Controls. In coverage tests, Roomba out-cleans the competition thanks to iAdapt Technology, iRobot's advanced system of software and sensors. Vacuums Along Wall Edges: Roomba uses Wall-Following Technology to clean right up to wall edges. Won't Get Tangled: Anti-Tangle Technology keeps Roomba from getting stuck on cords and carpet fringe. Robot products purchased in North America are intended for use in North America only. Both the 30-day, money-back guarantee and the limited warranty are void if products are used outside North America. *Roomba runtime remains the same between recharges. Battery lifetime varies with home environment and usage. Use Roomba as directed for longest battery life.